Pretty sure this sign was hung at the school in Royal Oak that David Grove works for, and evidently, it does truly need saving. David Grove claims to be an educator in Royal Oak, Michigan. I would like to say I'm sorry to all the kids in Royal Oak, because apparently this guy is both stupid and blind. 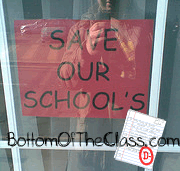 Yo, David, where do you see "it's" in "Save Our School's"?? I appreciate the intent here, but I don't see a misuse of an apostrophe. I see "it's," a contraction of "it is." That's fine in this context.